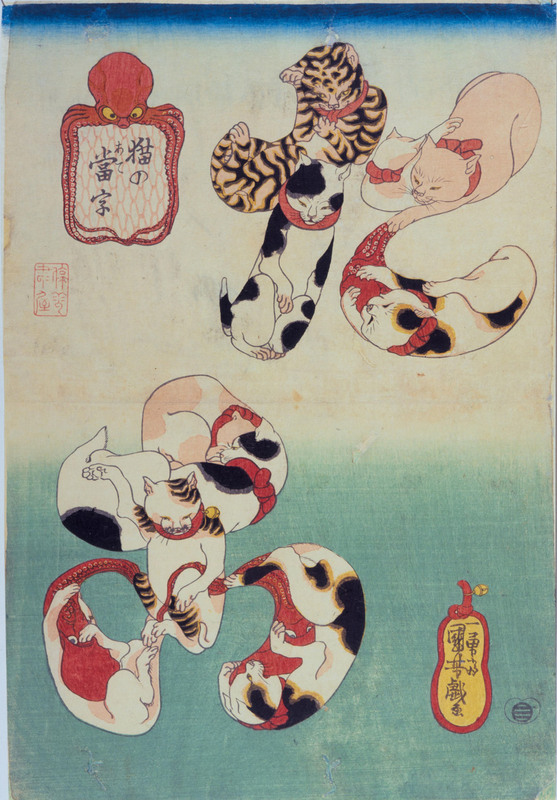 BEIJING - Utagawa Kuniyoshi was a true son of Edo. Born near Nihonbashi in 1797, his father a dyer, he grew up among the hoi polloi in the crowded streets of the low city, where popular stories of tattooed otokodate, the revered “street knights” of the kabuki stage, were capturing people’s imagination. Bluff in behavior, loyal to his friends and generous to his pupils, he also had a well-known passion for cats, whom he often depicted lovingly and humorously in his work. Kuniyoshi: Visionary of the Floating World, Edited by Rossella Menegazzo. He did not care much for money, was frequently in debt and always poorly dressed. 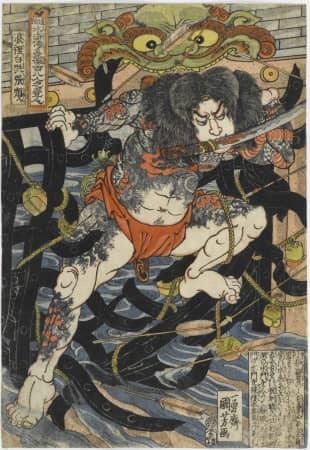 But he had talent galore, and though his first decade as a woodblock print artist was difficult — some say that at one point he even had to hawk tatami mats to survive — he became famous in his early 30s and would go on to develop a reputation equal to that of Hiroshige (1797-1858) or Kunisada (1786-1865). His childhood name was Yoshisaburo, but today, he is widely known as Kuniyoshi. He is the undisputed master of warrior prints. Kuniyoshi showed promise at an early age and in 1811, while still in his teens, he joined the large studio of Toyokuni I (1769-1825). The following years, which were somewhat frustrating, were mostly spent toiling sedulously in the shadow of other established artists. By the mid-1820s, Kuniyoshi was still a minor figure with little to no reputation. 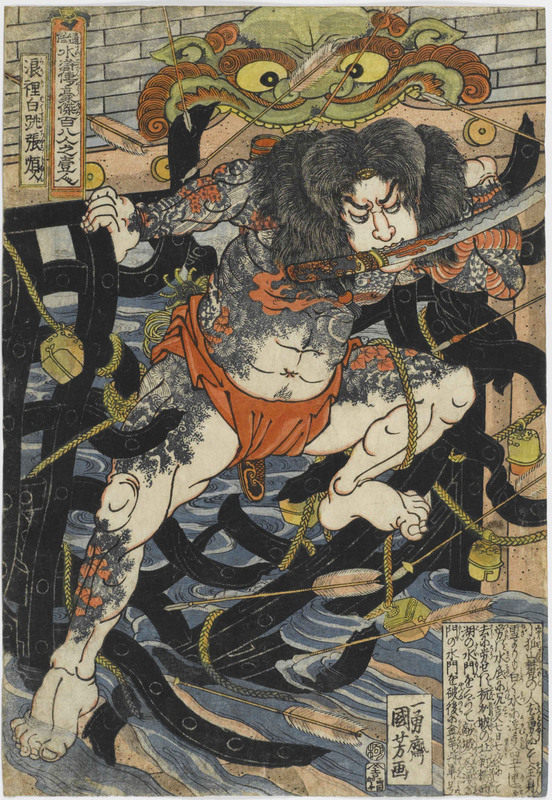 By comparison, Kunisada, who belonged to the same studio, already had a large following and was well on his way to become the most prolific and commercially successful print designer of his age. He was a bon vivant who led a colorful and very public life in the orbit of kabuki actors and courtesans of the pleasure quarters. He was the envy of many, Kuniyoshi not the least. Everything changed in 1827, when Kuniyoshi was commissioned to design a series of warrior prints inspired by a Chinese novel, “Outlaws of the Marsh,” known as “Suikoden” in Japanese, a 14th-century tale of chivalrous ruffians fighting boo-hiss government villains. Introduced in Japan in the early 18th century, the “Suikoden” became immensely popular after 1803 when an edition illustrated by Hokusai (1760-1849) was published. This was a time when the common people were growing increasingly frustrated with the “lazy” samurai class that lorded over them and so, in the words of Rossella Menegazzo, the editor of “Kuniyoshi: Visionary of the Floating World,” a new monograph on the artist, “the story and imagery associated with these characters immediately caught on in Japanese popular culture.” Kuniyoshi’s series of prints, the full name of which is “One Hundred and Eight Heroes of the Popular Suikoden All Told,” was never completed — today, only 74 designs are known — but demand was high and, by 1845, the original woodblocks had completely worn out. The series launched a “Suikoden” craze that lasted for decades. 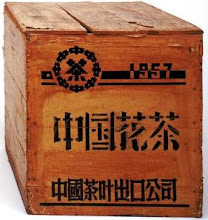 It also made Kuniyoshi’s name. Like most ukiyo-e artists, Kuniyoshi did not keep a diary and he left no letters. Large tracts of his life thus remain poorly understood and Menegazzo’s book does not reveal anything new about the man or his entourage of pupils, many of whom later became famous. However, it offers a lavish and engaging introduction to Kuniyoshi along with the main themes and sources of inspiration of his rich oeuvre. Western prints and books, imported through the Dejima Dutch emporium in the city of Nagasaki, had been available for decades and Kuniyoshi amassed a collection of his own to which he obviously frequently referred. The way in which he uses a vanishing point to suggest perspective, his precise depiction of human anatomy and his clever employment of foreshortening to depict figures from different angles and in varying poses all indicate a close familiarity with Western art. This, combined with his innovative use of multiple sheets of paper to expand a single design horizontally, gave a groundbreaking and exotic air to his work that greatly heightened its appeal. Scholars have noted how, in pre-modern Japan, there was no concept of “creative ownership.” Artists freely borrowed ideas and designs from each other with no sense of shame. 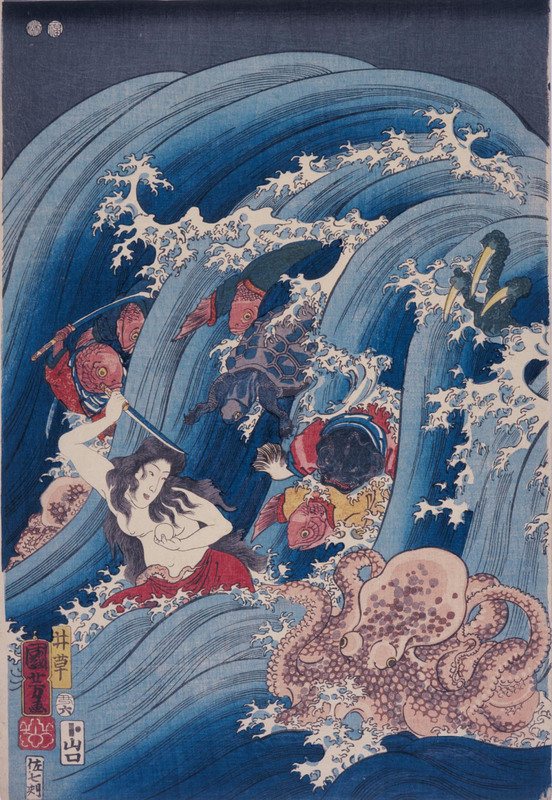 Anything catching the popular imagination, as Kuniyoshi’s work broadly did, was almost immediately reproduced by other artists and publishers. 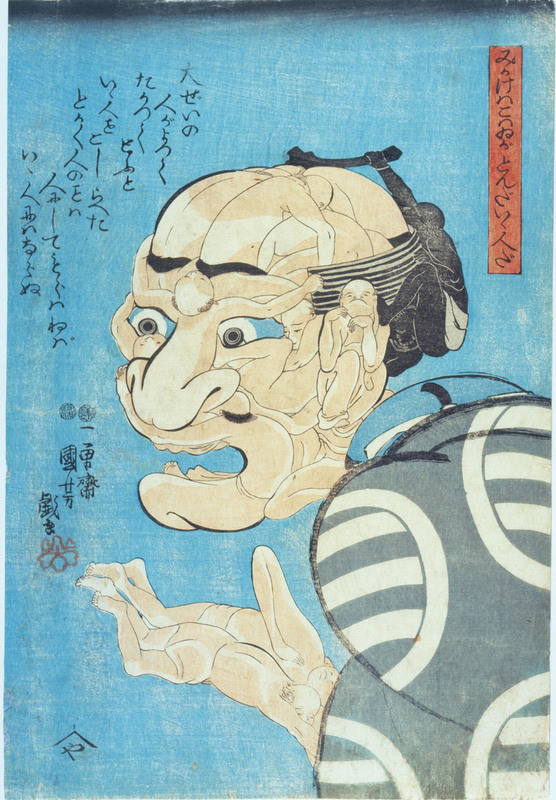 If imitation is the best form of flattery, Kuniyoshi was widely admired indeed.Art.